I am a former school teacher turned stay-at-home mom of Lauren, Elaina, and Tank . I got involved in LRPI after hearing about it for many years through family members. I have always valued family and was interested in doing something that could help children that did not have families or were living in poverty. I started with a very small service project for my local MOPS group, connecting mothers of preschoolers with orphans, and have become increasingly involved since then. The thing that I have enjoyed most about LRPI is that everyone who is involved with the group, both in Zambia and America, has a genuine heart and passion for what they are doing. Our God is an amazing God, able to connect people from across the globe to complete His purposes! I met Tannen while on a temporary assignment at Kennedy Space Center in Florida. Her enthusiasm and concern for the welfare of Zambian orphans piqued my interest and curiosity. As a longtime member of a Baptist church, I've always supported missions efforts through the Lottie Moon Christmas Offering and the Annie Armstrong Easter Offering, but never had a more direct role. Now I'm enjoying helping Renelle with some of the Earn It administrative work. I hope to become more involved in the future. I live outside Huntsville, Alabama, with my wife Annette and our two almost-grown children, Nathan and Amelia. I grew up in Nashville, TN and currently reside in Denver, CO. While attending Florida Atlantic University, I was involved with the Genocide Intervention Network and subsequently became deeply entwined with the dream of working in Africa. I met Tannen and her family by chance, while playing volleyball down in South Florida. It took barely thirty minutes of Tannen and her family describing LRPI's work for me to jump on board. It is not often that an organization can spread itself so wide and maintain the integrity and drive that LRPI does. It's an honor to work with a group of people whom care so deeply and work so tirelessly to make the world such a great place. Martinz is a 30 year old man who married and has one young daughter. He resides in Sikalangwe, Mufulira. He is one of our longest serving volunteers. He currently runs our Earn It program in Zambia and also serves as a facilitator in two STS clubs. He has been running STS clubs since 2006. He appreciates getting close to young people and sharing the gospel of Jesus Christ. 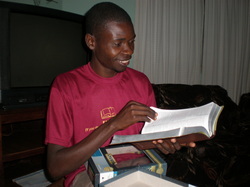 He is so devoted to them that he and his wife live with 6 of the Earn It students. He also wants to fulfill the calling he has to develop them into productive citizens and to serve the needs of vulnerable children.